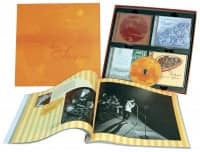 1 CD with 24-page booklet, 20 tracks, playing time 76:58 minutes. . The disco wave launched by the USA has brought pop back into the working class. Well, in the early '80s, it cooled down to lukewarm. White polyester suits such as the 'Saturday Night Fever' hero John Travolta wears them in the film had never quite been able to assert themselves in everyday life in the Federal Republic, and are now completely disappearing into oldkeider bags. Studded belts, fishnet stockings and stilettos, leather ties and cowboy boots, hairdryer waves and candy-coloured aerobic suits set the tone for glamorous fashion. The British electro-pop group Visage presents itself in this light. While some critics may perceive this music (or even the entire epoch) as bloodless and soulless, Visage Polydor has brought a new front-runner with Fade To Grey over seven weeks, starting in March 1981. But the band doesn't trigger a trend with their hit. Palestinian cloths, army parka, dungarees and five-mark 'nuclear power? No thanks!' pins are part of the uniforms of the peace movement and the environmentalists. The singer-songwriters, but also the jazz-funk of groups like Shakatak and Level 42, which spills over from England to the continent, meet their musical taste to a large extent. In addition, even at the beginning of the Decade, young people with colorfully dyed hair, mohawk cuts, worn clothes of selected ugliness and Doc Martens boots have long been part of the street scene in Germany. That's what punk looks like. You can also hear the punk since the late 70s. Produced by a milieu of growing youth unemployment and lack of perspective in Great Britain, the punk movement finds its mouthpiece in bands like Siouxie & The Banshees, tamed to plate format. Right at the beginning of the 80s, the Neue Deutsche Welle, or NDW for short, weighed on the FRG. Throughout the country, but above all in the Berlin scene, more and more groups have joined forces for quite some time to pick up the impulses of punk and New Wave and provide their music with original, fresh, rebellious, but above all German-language lyrics. The record industry, particularly shaken by general market saturation and the accompanying sales crisis, is advertising for NDW bands - who can resist this? - and slaughters the trends. The NDW reached its peak in 1982. This is the year when Hubert Kah and Miss Menke deliver their chartstormers to Polydor. Hubert Kemmler's Rosemarie and his starry sky as well as Franziska Menke's Hohe Berge manage without any 'No Future' attitude. Nonsense triumphs over frustration, and everyone can grölen along. But as quickly as the Neue Deutsche Welle spread, it ebbed away again in 1983, but left its mark. 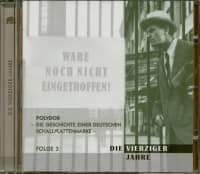 It is not only the merit of the German rock pioneer Udo Lindenberg, who has been an artist of the house since 1982, but also of the Neue Deutsche Welle, to have used the German song lyric again in a youth-friendly way and thus to have made it chartable. Nino de Angelo, for example, who in 1983/84 rushes past the Salvation World Hit with the train of peace-moved time and scores a number 1 hit with Jenseits von Eden, benefits from this. 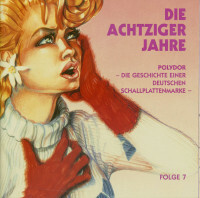 Also Felix de Luxe, who - according to the title - set off for Paris in a taxi in 1984, or the Bavarian Haindling, who arrives in the same year with his Du Depp, are examples of the fact that according to the NDW, German-speaking things without a traditional Schlager skingout can survive in the mass of the offer - despite many international superstars. On the other hand, popular hits are now also coming up, as Tommy Steiner (The Fisherwoman of San Juan), for example, proves. Since 1982 everything has sounded completely different: PolyGram was the first company to decide to flush the Compact Disc (CD) onto the world market. 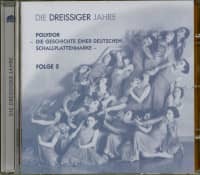 Sound purists initially accuse the new recording medium of cutting off the highs and lows of recordings, but the triumphal march of the twelve-centimetre silver cannot be stopped. Neither does Polydor. Formerly founded as an export brand of the Deutsche Grammophon Gesellschaft, Polydor became an independent company under the PolyGram umbrella in 1988. Customer evaluation for "Sinfonie der Sterne, 80er Jahre"